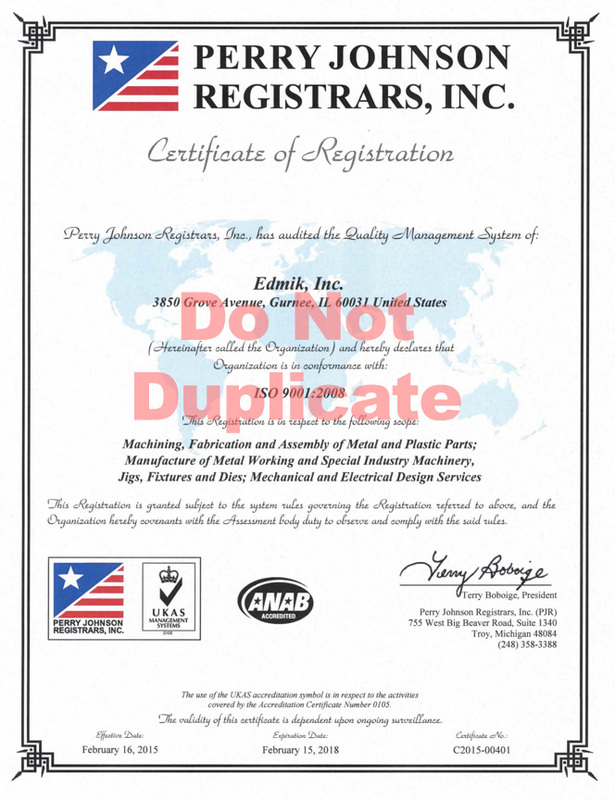 ISO 9001:2015 Registered - Edmik Inc.
Edmik’s team has earned the ISO 9001:2015 certification, because high-level quality inspection is an integral part of our production process. We pay strict attention to the details of our work – from planning, managing and administering the job to machining and finishing accuracy. All of our efforts meet or exceed regulated quality standards. Our commitment to customer satisfaction is reflected in flawless products and service. In addition, we continually invest in state-of-the-art measurement equipment to ensure excellent verifiable results. ISO 9001:2015 specifies requirements for a quality management system where companies need to demonstrate their ability to consistently provide product that meets customer and applicable regulatory requirements. Further, the certification aims to enhance customer satisfaction through the effective application of the system, including processes for continual improvement of the system and the assurance of conformity to customer and applicable regulatory requirements.